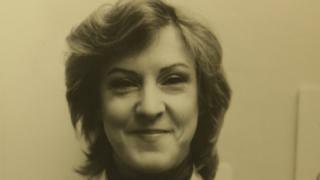 The unsolved murder of a solicitor whose body was found near the A1 in Cambridgeshire is being reviewed by police 35 years on. Janice Weston, 36, lived and worked in London and was last seen at her office on 10 September 1983. Her body was found the next day in a ditch close to the Brampton Hut roundabout, near Huntingdon. She had died as a result of blows to the head. Cambridgeshire Police said they were exploring "new forensic opportunities". The force said it carried out an "extensive" investigation at the time and was now appealing for new information. A spokesman said officers wanted to hear from people who "maybe did not tell us everything they knew", and those who contacted Crimewatch following a reconstruction, rather than police. Ms Weston was last seen at her office, Charles Russell and Co, at Lincoln's Inn Fields, at 16:15 BST. Her body was found by a time-trial cyclist the following morning. It was reported at the time that a half-eaten meal was found at her Notting Hill flat, leading police to believe she had left in a hurry. Her silver Alfa Romeo Alfetta was later found abandoned in Redhill Street in Regent's Park, London. Her husband had been on a business trip at the time of her murder and was interviewed and ruled out of the inquiry. Image caption The A1 pictured in 1983. Ms Weston's body was found near this spot.